This project, funded by the Music Therapy Charity has been undertaken by music therapists, Philippa Derrington (Cambridge) and Louise Neale (Hampshire). As part of her doctoral research, Philippa Derrington proposed a method which could be replicated. The lead investigation took place over a period of 19 months at The Cottenham Academy in Cambridgeshire in a first-ever study to show the quantitative benefits of music therapy for teenagers at a secondary school. Her study investigated whether music therapy can improve the emotional well-being of adolescents at risk of exclusion or underachievement. Specifically, it addressed music therapy’s impact on students’ self-esteem, anxiety, behaviour, relationships with peers and attitudes towards learning. A mixed-methods design was used to observe the changes in students before and after music therapy. Quantitative data was collected from students, teaching staff and school records on four occasions during the study, as well as qualitative data from interviews with the students before and after their block of music therapy. The interviews were carried out by Dr. Marion Long of the Institute of Education, London. The study found that music therapy made a positive difference to the 22 students who took part from both the mainstream and special school. 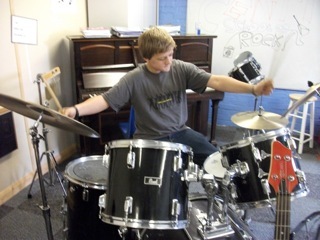 There was a 95% attendance rate for music therapy sessions, which Derrington describes as "remarkable, because sessions were not compulsory and these young people tend to vote with their feet, so their attendance in itself is credit to their commitment and motivation to use music as a means to relate with another person and express themselves." "This study has indicated that music therapy can reduce anxiety, increase a student’s self-esteem and help reduce distruptive behaviour. If subsequent studies can prove similar benefits of music therapy, the greater the opportunity for significant data and I believe there is certainly a case for it to be made available in scondary schools across the UK." This project, funded by the Music Therapy Charity was conducted in collaboration with The Cottenham Academy, Anglia Ruskin University and the Institute of Education in London. The study has been replicated by music therapist Louise Neale at a learning centre in Eastleigh, Hampshire, through the music therapy service Key Changes.